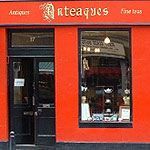 Located between the Festival Theatre and the Queens Hall, Anteaques specialise in traditional teas and antiques. They serve a variety of teas including black, green, scented and infused flavours. Do you work at Anteaques? What did you think of Anteaques? Came across Anteaques the other day and it is so unique. This shop is amazing! There is a delectable selection of unusual and interesting antiques, ranging form clothing to mirrors and sinks. The service you receive is impeccable; the owner of Anteaques is a wonderful host making a cup of tea an unforgettable experience - so friendly. There is a large selection of very high quality loose leaf teas and home baking. Your tea is served in a huge antique pot with a china cup and silver tea spoon... an absolute delight - and significantly less expensive than the chain coffee shops!! I can't recommend Anteaques more highly. The nifty name, the novel concept, and the reassuringly old double door are all too intriguing to just walk past. Take a break from the run-of-the-mill and step inside. Everything in here (apart from the teas and scones) is an antique and it is also for sale should it so take your fancy. On entering, you are greeted by a wonderful sight: a boot scraper and an umbrella and music stand displaying a comprehensive tea menu. You can choose to sit at one of the two tables in the front room of the cafe or walk through the arched doorway and settle yourself in the back room, which feels almost like a private parlour. It’s impossible to resist taking a wander around once you’ve ordered your tea. The back room is full of noteworthy objects, from the set of six solid silver Peruvian teaspoons with a miniscule llama forming the tip of each handle (£18), to the little dressing table facing out of one of the sash windows complete with mirror, hairbrushes and glove stretchers. In the front room there is a huge cabinet displaying a diverse range of antique tea sets. If you are tempted to buy one you can even try it out by having your tea served in it to make sure it’s the right one for you. This venture is the result of two people, with different specialisms, successfully slotting those specialisms together to form a seamless and appealing blend. One of the owners brings his love of antiques to the mix and the other, from New Zealand, contributes his enthusiasm for fine teas. Due to the small number of tables there is no danger of hordes of customers threatening to detract from the relaxed, genteel quality of the place. The pots of tea are fantastic value for money at just £2.50 for any variety; they are huge and give two people several cups of tea each. Just be forewarned: there isn’t a toilet on the premises, but there are public conveniences not too far away, behind Nicolson Square. Of course, everything used to serve your tea in will also be an antique so you’ll find that the tea pots are silver-plated (1920s/30s), your tea cups might be fine bone china (for e.g. Victorian-Limoges), and your teaspoons may even be gold plated. If you want to avoid caffeine, go for the Night Melody infusion which has an aroma of sweet roses, a definite taste of honey (due to the honeybush it contains) and a delicate thread of limeflower. The Chocolate Mint tea, containing Chinese black teas, mint leaves and chocolate, smells delightfully of After Eights and leaves a cool, minty aftertaste in the mouth which contrasts interestingly with the actual warmth of the tea. For a little self-indulgence try the Jasmine Pearls: Chinese green tea scented with Jasmine blossoms is rolled by hand to form small pearls which unfurl when hot water is poured on them, surrendering their sensuous perfume. All of the teas can be bought loose to take home. You can even ask for a takeaway sample (50p), where an empty teabag is filled with a tea of your choice. And, for the environmentally conscious, it’s good to know that all the leaves used in the cafe are subsequently composted. Homemade scones are £1 and if you want butter and jam to go with your scone just add 20p. An original idea that has been well executed. Opening times are a bit restricted at the moment but this adds an old-fashioned charm and they may be extended in the future.